Department of Electrical Engineering, University of Texas-El Paso, El Paso, TX, 79902, U.S.A. Exercise Science Program, The University of New Mexico, Albuquerque NM, 87131, U.S.A.
We hypothesized that the protocol-induced initial cadence of the WAnT is too high to allow high muscle force production and peak power generation. Twenty endurance, strength or power trained subjects (9 male, 11 female) completed two 30 s maximal exertion stationary cycle ergometer tests involving the traditional peak cadence start (TRAD) vs. a stationary start (STAT). Inertia corrected mechanical power, cadence, EMG from the vastus lateralis, and applied force to the pedals were measured continuously throughout both tests. Peak power was higher during TRAD; 11.32 ±1.41 vs. 10.40 ±1.35 Watts/kg (p < 0.0001), as was peak cadence; 171.4 ±16.3 vs. 120.9 ±15.1 rev/min (p < 0.0001). However, during TRAD EMG root mean squared (rms) increased continuously throughout the test, force applied to the pedals increased from 1 to 3 s (0.73 ±0.27 vs. 0.90 ±0.39 N/kg; p = 0.02) and thereafter remained relatively stable. EMG mean frequency also increased from 1 to 3 s, but then decreased throughout the remainder of the test. During TRAD, mechanical power decreased near immediately despite increasing EMG rms, EMGmean frequency and force application to the pedals. The initial 10 s of data from the WAnT is invalid. We recommend that intense cycle ergometer testing should commence with a stationary start. 1. Bar-Or O. The Wingate anaerboic test. An update on methodology, reliability and validity. Sports Med 1987; 4: 381–394. 2. Bassett DR. Correcting the Wingate Test for Changes in Kinetic Energy of the Ergometer Flywheel. Int J Sports Med 1989; 10: 446–449. 3. Beneke R., Pollmann C., Bleif I., Leithauser R., Hutler M. How anaerobic is the Wingate Anaerobic Test for humans? Eur J Appl Physiol 2002; 87: 388–392. 4. Burden A. How should we normalize electromyograms obtained from healthy participants? What we have learned from over 25 years of research. J Electromyogr Kinesiol 2010; 20: 1023–1035. 5. Dimitrova N., Dimitrov G. Interpretation of EMG changes with fatigue: facts, pitfalls, and fallacies. J Electromyogr Kinesiol 2013; 13: 13–36. 6. Dorel S., Gouturier A., Lacour J-R., Vandewalle H., Hautier C., Hug F. Force-velocity relationship in cycling revisited: Benefit of twodimensional pedal forces analysis. Med Sci Sports Exerc 2010; 42: 1174–1183. 7. Dotan R., Bar-Or O. Load optimization for the Wingate Anaerobic Test. Eur J Appl Physiol 1983; 51: 409–417. 8. Dotan R. The Wingate anaerobic test’s past and future and the compatibility of mechanically versus electro-magnetically braked cycleergometers. Eur J Appl Physiol 2006; 98: 113–116. 9. Farina D. Interpretation of the surface electromyogram in dynamic contractions. Exerc Sport Sci Rev 2006; 34: 121–127. 10. Fernandez-del-Olmo M., Rodgrique A., Marquez G., Iglesias X., Marina M., Benitez A., Vallejo L., Acero R. Isometric knee extensor fatigue following a Wingate test: peripheral and central mechanisms. 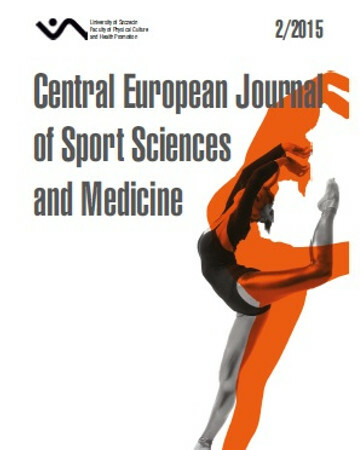 Scan J Med Sci Sports 2013; 23 (1): 57–65. 11. Hautier C., Linossier M., Belli A., Lacour J., Arsac L. Optimal velocity for maximal power production in non-isokinetic cycling is related to muscle fibre type composition. Eur J Appl Physiol 1996; 74: 114–118. 12. Hug F., Dorel S. Electromyogaphic analysis of pedaling: A review. J Electromyogr Kinesiol 2009; 19: 192–198. 13. Hug F., Drouet J., Champoux Y., Couturier A., Dorel S. Interindividual variability of electromyographic patterns and pedal force profiles in trained cyclists. Eur J Appl Physiol 2008; 104 (4): 667–678. 14. Hunter A., St Clair Gibson A., Lambert M., Nobbs L, Noakes T. Effects of supramaximal exercise on the electromyographic signal. Br J Sports Med 2003; 37: 296–299. 15. Inbar O., Bar-Or O., Skinner J. The Wingate Anaerobic Test. Human Kinetics, Champaign, 1996. 16. Jastrzębski Z. Selected aspects of anaerobic capacity by applying the wingate test. Biology Sport 1995; 12: 131–135. 17. Jones N., McCartney N., Graham T., Spriet L., Kowalchuk J., Heigenhauser .J, Sutton J. Muscle performance and metabolism in maximal isokinetic cycling at slow and fast speeds. J Appl Physiol 1985; 59: 132–126. 18. Katch V., Weltman A., Martin R., Gray L. Optimal test characteristics for maximal anaerobic work on the bicycle ergometer. Res Quart Exerc Sport 1977; 48: 319–327. 19. Laurent C. Jr, Meyers M., Robinson C., Green J. Cross-validation of the 20- versus 30-s Wingate anaerobic test. Eur J Appl Physiol 2007; 100: 645–651. 20. MacIntosh B.R., Neptune R.R., Horton J.F. Cadence, power, and muscle activation in cycle ergometry. Med Sci Sports Exerc 2000; 32 (7): 1281–1287. 21. MacIntosh B., Rishaug P., Svedahl K. Assessment of peak power and short-term work capacity. Eur J Appl Physiol 2003; 88 (6): 572–579. 22. Marsh A., Martin P. The relationship between cadence and lower extremity EMG in cyclists and noncyclists. Med Sci Sports Exerc 1995; 27: 217–225. 23. Maud P., Shultz B. Norms for the Wingate anaerobic test with comparison to another similar test. Res Quart Exerc Sport 1989; 60 (2): 144–151. 24. Reiser Ii R., Peterson M., Broker J. Instrumented bicycle pedals for dynamic measurement of propulsive cycling loads. Sports Engineering 2003; 6 (1): 41–48. 25. Samozino P., Horvais N., Hinty F. Why does power output decrease at high pedaling rates during sprint cycling? Med Sci Sports Exerc 2007; 39: 680–8687. 26. Santos E., Novaes J., Reis V., Giannella-Neto A. Low sampling rates bias outcomes from the Wingate test. Int J Sports Med 2010; 31: 784–789. 27. Smith J., Hill D. Contribution of energy systems during a Wingate power test. Br J Sports Med 1991; 25: 196–199. 28. Spriet L., Sodeland K., Bergstrom M., Hultman E. Aerobic energy release in skeletal muscle during electrical stimulation in men. J Appl Physiol 1987; 62: 611–615. 29. Spriet L., Sodeland K., Bergstrom M., Hultman E. Skeletal muscle glycogenolysis, glycolysis, and pH during electrical stimulation in men. J Appl Physiol 62: 1987; 616–621. 30. Withers R., Van Der Ploeg G., Finn J. Oxygen deficits incurred during 45, 60, 75 and 90-s maximal cycling on an air-braked ergometer. Eur J Appl Physiol 1993; 67: 185–191. 31. Zupan M., Arata A., Dawson L., Wile A., Payn T., Hannon M. Wingate anaerobic test peak power and anaerobic capacity classifications for men and women intercollegiate athletes. J Strength Cond Res 2009; 23: 2598–2604.